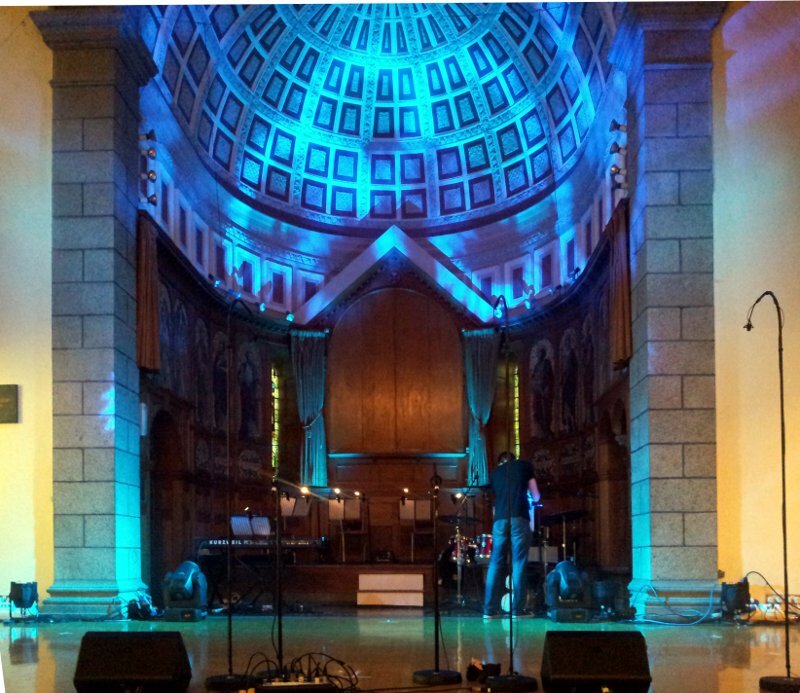 Update (today: 9:53 pm): Here's a review from Johan of the Yahoo AV Group of his concert experience in Guernsey. 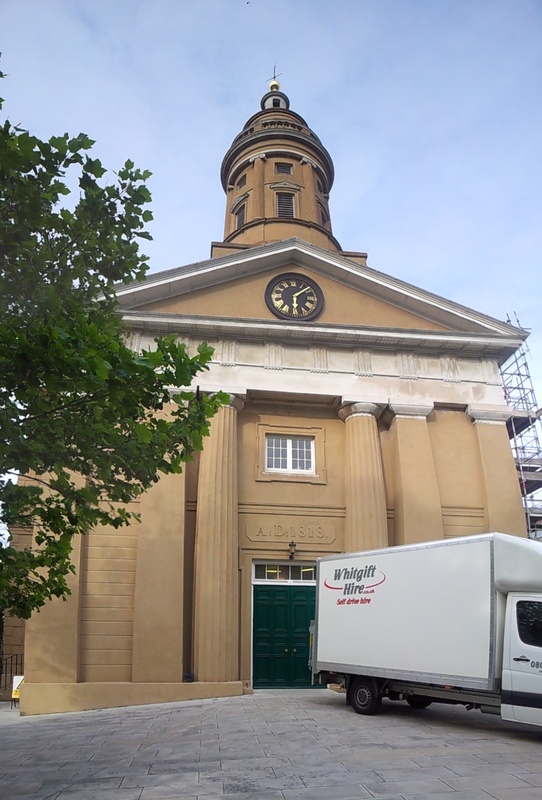 Thanks for sharing, Johan :). Even the start, although the same songs, was different. 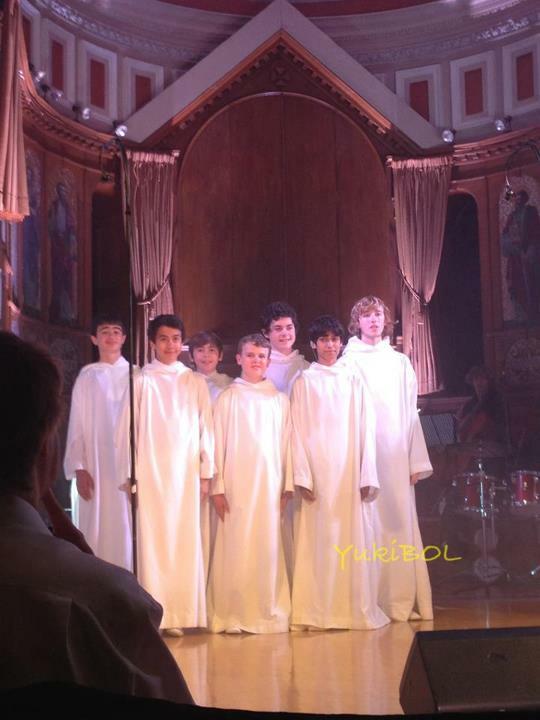 Jubilate was started solo by Matthew R.A., who was then joined by Thomas and the rest of the group. 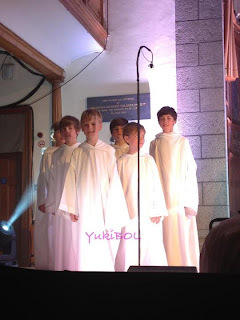 After the transition from Jubilate into Libera Eoghan and Luke formed a duo of soloists. After this Ben and Cassius did the introduction and welcome. As Ralph is not here the solo of the Song of life fell to Isaac. Sometimes a little hesitant he did a good job of it. 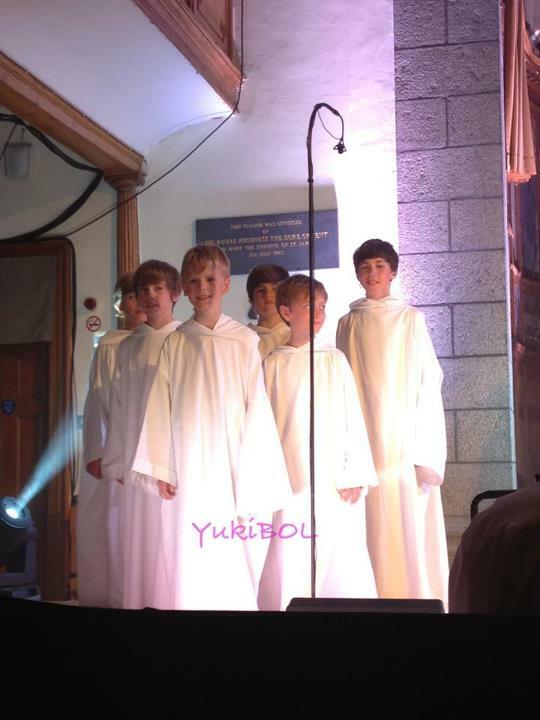 While the front row of boys was kneeled, Eoghan did the solo of Sanctissima, excellent as always. 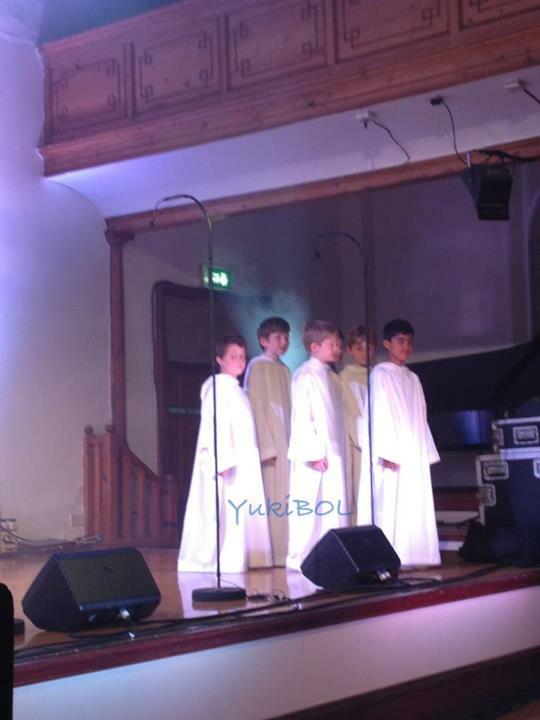 Next was Sanctus for which Matthew Jansen did the solo. I know others praised his performance on other occasions, but for me it was now that he came really into the picture. It was beautiful. After this Cassius and Michael U.R. introduced Moose. Next I vow to Thee, with Matthew Jansen and Dyllan and Thomas in front. An excellent performance. In absence of Stefan and Ralph Eternal Light was for Jude with assistance of Thomas. They did a pretty good job, but have to gain some experience yet. Salva me was done by the whole group with the hoods on. Beautifully done, but I could not see who did what. Next Jude introduced the musicians and Rob. Then the eagerly awaited Faithful heart with Josh as principal soloist, but supported for the harmonies by Matthew Jansen, Thomas and Dyllan. 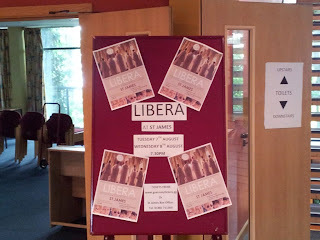 It was indeed wonderful with Josh starting off as a light tenor but later gong into the baritone range. The voices of Josh and especially Matthew blended perfectly. Next was Exsultate, which is always an uplifting song. Thomas was the soloist again, this boy was seen often in front this evening. After this they suddenly disappeared from the stage and there was the interval. After the interval Eoghan started with his now known solo of Attendite, after which the group did the Orinoco flow, devided into five groups. It was a nice and crisp performance. Than Gloria, one of my favorite songs. In Arundel I was a bit disappointed, but this time it was beautiful. I think overall the sound was much better balanced here than it was in Arundel, where it was often just too loud. Then Michael and Cassius explained about the clothes and the hoods. After which Matthew Jansen and Thomas were the soloists in The Fountain and very well they did it too. These two boys were the centre of the whole concert, nearly every song one or both of them were involved in some special role. Dies Irae had a surprise for me. A beautiful solo by Ciaran. He was good!!! Nothing more to say, come to hear him tonight, there are still tickets. Grateful heart was next and duo'd by Thomas D.L and Michael U.R..
Stay with me had Cassius up front but he did not really do a solo, apart from a few lines at the end. Matthew R.A. did the discounts as usual. Then Josh explained about voices and voice change after which he moved to the piano for the next song. Up to then the piano had been played by Steven G. if he was not playing the clarinet or recorder. 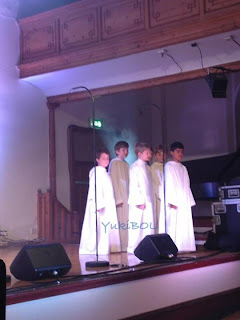 That next song was Ave verum which ended in th V formation with Jacob and Tiarnan up front, and Matthew still hidden from view for the high notes. Far away was for Isaac, but not as convincing as he was in Arundel. Glory to Thee an excellent performance of Eoghan. He is a class performer and under used, maybe he does not want too many solos? The last song was How shall I sing that Majesty with an excellent solo of Eoghan without the support of Stefan this time. All in all a very nice concert. Another successful concert at Guernsey. 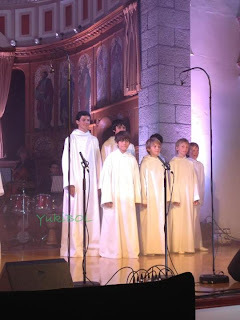 The songs and soloists are the same from the two Jersey concerts. And Patrick, Yorkie and Yuki shared with us some of their amazing photos. Thanks so much, guys. You're fantastic! Please credit them btw.